Our QI441 Mobile impact crusher is a pioneering solution offering primary and secondary crushing in one unit. 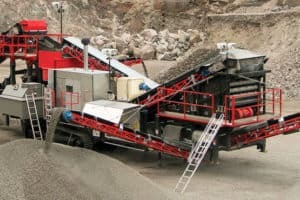 This Mobile impact crusher features our patented Sandvik CI412 4-blowbar Prisec™ impact box. Our revolutionary design makes it an essential solution if you need to process aggregate and construction materials on site. The QI441 Mobile impact crusher will give you high reduction ratios, superb product shape and unsurpassed productivity. We have even developed the world’s first Doublescreen hanging screen system to ensure your throughput is not compromised by a conventional single box. This allows an even greater return on your investment as it will produce accurately sized product for immediate use. 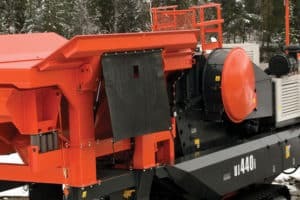 Our QI441 crusher has a 1360 x 800mm / 54 x 31 ½” feed opening that can be further extended via remote control to accommodate your larger oversized material. We have designed this unit to ensure you get uninterrupted production with unprecedented levels of control. As well as being flexible during operation, the QI441 mobile impactor is also capable of operating in the most hostile environments. 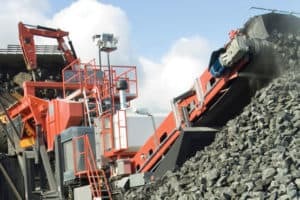 The crusher and screening system allows customers an even great return on investment by being able to produce accurate products to meet customer demands. 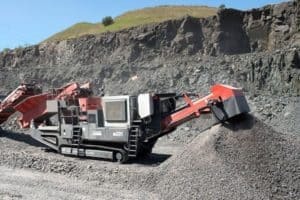 The QI441 mobile impact crusher offers excellent versatility, and with an overband magnet, pre screen and underpan feeder fitted as standard you can be assured the QI441 impactor will boost your operation’s profitability.